WIRELESS CHARGING, WINDOW, POWER, REAR SLIDING WITH REAR DEFOGGER, WHEELS, 20" X 9" (50.8 CM X 22.9 CM) ULTRA BRIGHT MACHINED ALUMINUM with painted accents, UNDERBODY SHIELD, TRANSFER CASE PROTECTION, TRANSMISSION, 6-SPEED AUTOMATIC, ELECTRONICALLY CONTROLLED with overdrive and tow/haul mode. Includes Cruise Grade Braking and Powertrain Grade Braking (STD), TRAILER BRAKE CONTROLLER, INTEGRATED, TIRES, P275/55R20 ALL-TERRAIN, BLACKWALL, SUSPENSION PACKAGE, OFF-ROAD includes Z71 chrome side front fender emblems, monotube Rancho brand shocks and (K47) air cleaner, (JHD) Hill Descent Control, (NZZ) underbody shield, SUMMIT WHITE, STEERING WHEEL, HEATED, LEATHER WRAPPED with audio and cruise controls. This GMC Sierra 1500 has a powerful Gas V8 5.3L/325 engine powering this Automatic transmission. ALL-TERRAIN PACKAGE includes (CGN) spray-on bed liner, (UHN) 18" x 8.5" (45.7 cm x 21.6 cm) bright machined aluminum wheels, (Z71) Off-Road Suspension Package with monotube Rancho shocks, (NZZ) underbody shield, (UD7) Rear Park Assist, (B58) carpeted floor mats, (VB5) front body-color bumper, (DD8) auto-dimming inside rearview mirror, (VT5) rear body-color bumper with corner steps, unique grille with body color surround and chrome accents, bright sill plates and All-Terrain cluster. All-Terrain side emblem replaces Z71 side emblem. Includes (AN3) front bucket seats and (UQA) Bose premium audio system. Upgradeable to (NZH) 20" wheels with (RC7) 20" tires or LPO 20" and 22" tires and wheels. ), ALL TERRAIN SLT PREMIUM PACKAGE includes (NZH) 20" x 9" ultra bright machined aluminum wheel with painted accents, (UD5) Front and Rear Park Assist, (UVD) heated steering wheel and (A48) sliding rear window. With Crew Cab model includes (BVQ) 6" rectangular chrome tubular assist steps. With Double Cab model includes (VXH) 6" rectangular chrome tubular assist steps.) , SEATS, FRONT FULL-FEATURE LEATHER-APPOINTED BUCKET with (KA1) heated seat cushions and seat backs. Includes 10-way power driver and front passenger seat adjusters, including 2-way power lumbar control, 2-position driver memory, adjustable head restraints, (D07) floor console and storage pockets. 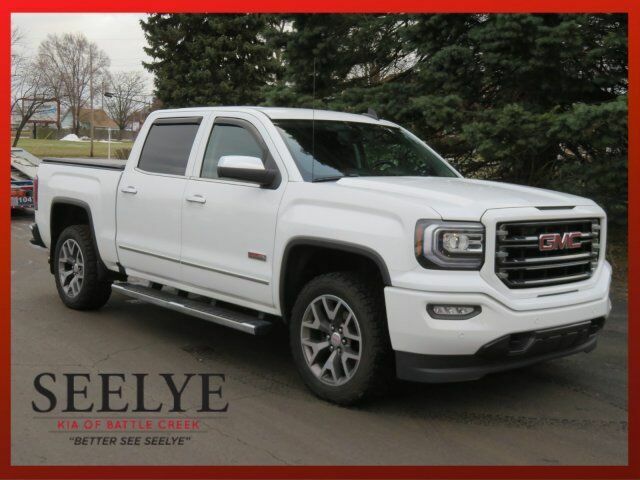 (Includes (K4C) wireless charging., REAR AXLE, 3.42 RATIO, LICENSE PLATE KIT, FRONT, JET BLACK/SPICE RED ALL-TERRAIN, LEATHER-APPOINTED FRONT SEAT TRIM, HILL DESCENT CONTROL, HEADLAMPS, HIGH-PERFORMANCE LED HEADLAMPS WITH GMC SIGNATURE LED LIGHTING, GVWR, 7200 LBS. (3266 KG) (STD), FRONT AND REAR PARK ASSIST, ULTRASONIC, FLOOR MATS, COLOR-KEYED CARPETED FIRST AND SECOND ROW, ENGINE, 5.3L ECOTEC3 V8 WITH ACTIVE FUEL MANAGEMENT, DIRECT INJECTION and Variable Valve Timing, includes aluminum block construction (355 hp [265 kW] @ 5600 rpm, 383 lb-ft of torque [518 Nm] @ 4100 rpm; more than 300 lb-ft of torque from 2000 to 5600 rpm) (STD), CUSTOMER DIALOGUE NETWORK, CONSOLE, FLOOR MOUNTED with cup holders, cell phone storage, power cord management, hanging file holder capability and (K4C) wireless charging, BUMPER, REAR BODY-COLOR with corner steps, BUMPER, FRONT, BODY-COLOR LOWER, BOSE SOUND WITH 6 SPEAKER SYSTEM (7 speaker system including subwoofer when ordered with bucket seats) includes (NKC) noise control system. ), BED LINER, SPRAY-ON Pickup box bed liner with GMC logo consisting of high pressure, chemically bonded, sprayed-on polyurea & polyurethane liner formulation. Liner is permanently bonded to the truck bed providing a water tight seal. The textured, non-skid surface is black in color and robotically applied to yield consistent 90 mil floor and tailgate thickness along with 50 mil box sidewall thickness. Spray-on liner covers entire bed interior surface below side rails, including tailgate, front box top rail, gage hole plugs and lower tie down loops., AUDIO SYSTEM, 8" DIAGONAL COLOR TOUCH SCREEN NAVIGATION WITH INTELLILINK, AM/FM/SIRIUSXM, HD RADIO with USB ports, auxiliary jack, Bluetooth streaming audio for music and most phones, advanced phone integration featuring Apple CarPlay, Pandora Internet radio and voice-activated technology for radio and phone, ASSIST STEPS, CHROMED TUBULAR, 6" RECTANGULAR.